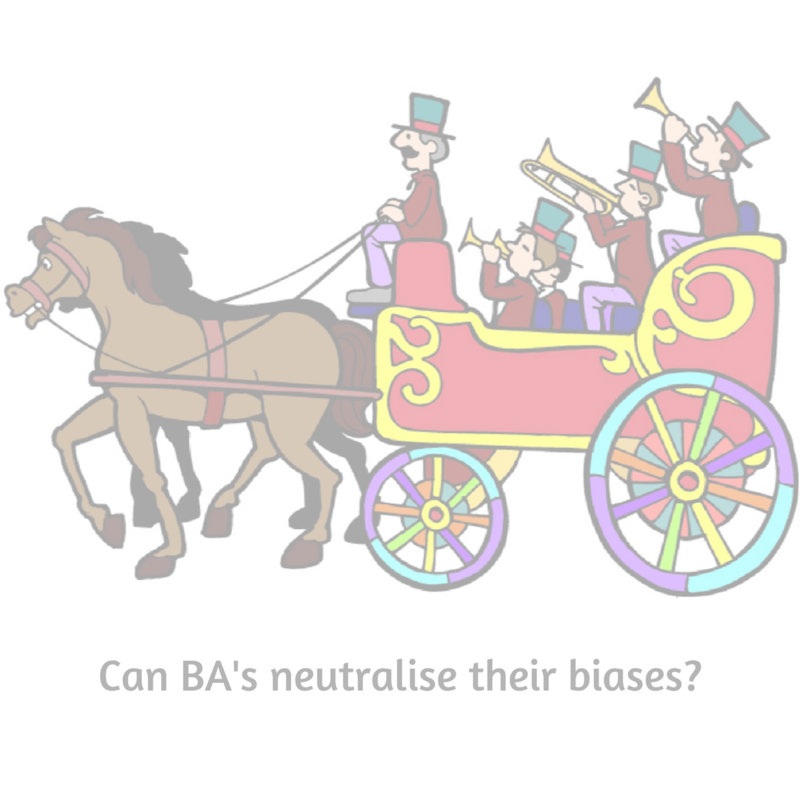 Can BA’s neutralise their biases? A question from Andy in the UK, “How can you train BAs to neutralise their unconscious biases? I thought this was an absolutely brilliant question. You can’t train people out of their cognitive biases because they are too instinctive. Plus, it would help nobody to move all their instinctive decision-making process to logical decision-making processes. They are so much slower, you would get nothing done! However, people can learn techniques to overcome them where it matters. To overcome cognitive biases you firstly need to know they exist and the effect they have on people’s decision making. Awareness is just the first step though. There is such a variety of cognitive biases that keeping them in your head is a full-time job. Support the general awareness with checklists that your team can run through when arranging meetings or workshops to make sure you have considered ways of mitigating common ones. Does your organisation use BA’s properly? A BA is not just a documenter of requirements. There are too many projects where people think the role of a BA is to, “Just write down what you’re told and make it nice”, and then they sign off the document. This does not use the skills of a business analyst as they should be used. The business analyst should be a prober who knows how to question effectively. The BA is the person who should challenge the facts and opinions they are given, ask open questions and expect to speak to the right stakeholders. In some projects, stakeholders claim they are “too busy” to talk to a Business Analyst. You must talk to representative stakeholders, including end users to get past assumptions, biases and known patterns to the real needs. I find, in my mentoring, that too many BAs are just left to ‘get on with it’. They have very little in the way of support to develop themselves. I strongly believe all BAs should be trained in facilitation, rather than just being expected to be able to facilitate. Facilitation techniques teach you how to manage a wide range of cognitive biases. A very common one that appears in workshops is the Bandwagon Effect. The Bandwagon Effect is where everyone agrees with the first person who comes up with an idea or states a position, and never then put their own position forward. They’ve all climbed on the bandwagon with that person. When I started out, I didn’t know about this effect but, like many other people I found it to be a problem. Over the years I picked up and developed strategies to try and prevent it happening. So, I now know to allow a period of quiet reflection at the beginning of an ideation session where people to write down their own ideas on post-it notes without hearing other people’s. Then, when all the post-it notes are up on a wall we can examine all ideas together. Those are just a couple of techniques to manage the Bandwagon Effect. There are many others you can use for problem-solving, they help stretch people’s ideas, give them different ways to think and stop them just relying on patterns and the first thing that jumps to mind. These techniques are hugely valuable in getting people to innovate. BAs need a range of techniques in their ‘toolbox’. These techniques are not gimmicky, when you give people a different way of approaching a problem, it can bring to the fore aspects they haven’t actively thought of yet and gets them exercising their logical, rational brain rather than their instinctive one. And yes, it can feel a bit uncomfortable trying a brand new technique for the first time. But push yourself to do it. The quality of the decisions you make in your teams is what creates the value in your projects. This entry was posted in Cognitive Biases. Bookmark the permalink.